Blake & Sons Moving & Storage provides local movers and packers you can trust to provide customized full-service. Blake & Sons Moving & Storage recognizes the importance of smooth corporate relocations and stress-free employee transfers. Using the latest industry packing methods and moving materials, our expert movers can pack your entire home in detail. When moving a family or business, there’s always a laundry list of things that you must track and worry about. At Blake & Sons Moving & Storage, we work to make the packing, storage, and logistics as stress free as possible. We will take the time to understand your individual move and storage requirements, and we’ll then build and execute a plan to remove as much of this stress as possible. Sure, there are other moving companies out there, JK Moving and A-1 Moving to name a few. At Blake & Sons Moving & Storage, we will do our best to treat you better than our competitors, and we’ll work collaboratively with you from start to finish to ensure the job gets done in a safe, timely, and professional manner.If you are looking for reputed and reliable movers in Maryland, please feel free to contact us. When it comes to moving your multi-office facility, warehouse or even your business, hiring a professional moving can be helpful. Moving all your furniture, equipment or everything else can be a hassle and a more waste of time. Hiring professional commercial moving services in Maryland for your business relocation have lots of benefits including stress-free transition, easily move your business without missing anything, give you additional manpower and much more. If you are looking for professional and trained commercial movers in Maryland, we at Blake & Sons Moving & Storage are here to help you. We ensure to relocate your office furniture, computer systems and workstations safely and securely. Your items will be packed carefully and properly. Moreover, you can trust our movers with your valuables because they have years of experience and are full-time employees. Blake & Sons Moving & Storage is the best and professional moving company in Maryland. For your residential and commercial moving you can always rely us on for professional service and exceptional value. Our knowledge and experience of more than 20 years make us handle moves of all sizes and scopes. Call us on (301) 610-5310, or email us at contact us@blakemoving.com today. If you need extra space to store your vehicle, excessive luggage, furniture or anything else and looking for storage facilities Maryland, then you should do what many people do in Maryland. Rent our storage facilities! 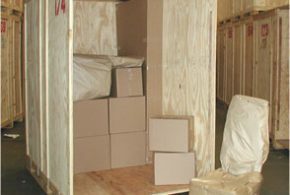 Blake & Sons Moving & Storage is one of the most reputed storage companies offering containerized storage that can be hired at affordable costs. We keep containers in our secure warehouse for storage. Our warehouse is fully equipped with advanced storage systems, advanced security systems such as fire alarms, sensor-based alarms, cameras and 24-hour professional security services. Our storage facilities offer longterm and short-term solutions as per your particular needs and budget. Each relocation Blake & Sons performs is as unique as the family being relocated. To meet the distinct and individual needs of each family, we at Blake & Sons have a dedicated network of team members ready to assist you in the various areas of your move. Blake & Sons Moving & Storage, Inc. Copyright ©2018 Blake & Sons Moving & Storage, Inc. All rights Reserved. would you like to fill out an inventory form so we may provide you an online estimate?